The candidates for Austin's District 3 council seat. Sabino "Pio" Renteria hopes to continue representing Austin's District 3 come the November election. He faces five other candidates, including his sister. Renteria and his sister were in a runoff election for his current seat in 2014. 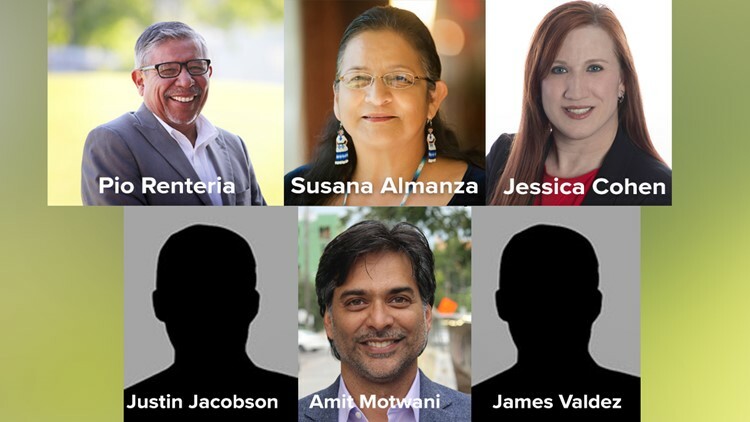 AUSTIN — Current District 3 Austin Council Member Sabino “Pio” Renteria is running against five other candidates – including his sister -- in hopes of securing his representation of the district which spans South and East Austin. KVUE has reached out to each candidate to determine where they stand on key issues. Check back on this story as their responses trickle in. A lifetime citizen of Austin’s District 3, Renteria retired from IBM after 34 years of serving as a computer and printer technician before becoming council member in 2015. Renteria and his sister, Susana Almanza, were in a runoff election for District 3 in 2014. Almanza, director of the advocacy group PODER (People Organized in the Defense of Earth and her Resources), is running against her brother, Renteria, for a second time. A native of East Austin, Almanza also serves as president of the Montopolis Neighborhood Association and is a former member of the City of Austin Environmental Board, Planning Commission and Community Development Commission, according to PODER’s website. Originally from Houston, Cohen said she has spent the majority of her adult life living in Austin’s District 3 right off of Oltorf Street. She has been a public servant for 24 years, serving as an EMT in Austin, her campaign website said. Her website features an image of herself assisting during South by Southwest in 2014, when Rashad Owens plowed through a crowd on Red River Street, killing four and injuring 20 others. Her campaign focuses on education, transportation and infrastructure and affordability. Jacobson, a restaurant worker who has worked on political campaigns, said his family goes back generations in Austin. It was the new generation of empowered voters who inspired him to run for for the District 3 City Council seat, his campaign website said. His campaign will focus on affordability, transportation and inclusivity and equity. Motwani, an Austinite of 22 years, is chief information officer at United Way for Greater Austin. He said he believes affordability efforts in the city should focus more on social services as well as housing, KVUE’s media partners at the Austin American-Statesman said. Valdez is a real estate agent who sits on the city’s Board of Adjustment and previously served on the Travis County Appraisal District board, the Statesman said.